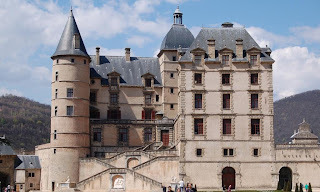 Yesterday we went to visit the chateau at Vizille, it has a lovely park and we have visited it before. We only had one boy who was up for a trip to the museum, which had been rejected as boring last time we were there. When we arrived we decided it was too nice and sunny to be indoors, so instead we walked around the park and admired the colour all around. 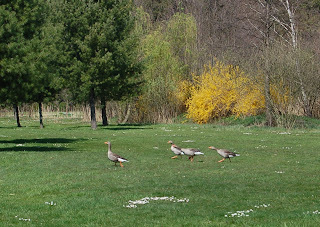 Love was in the air for the ducks and swans, which caused quite a lot of hilarity as they chased off some of the kids who got too close. 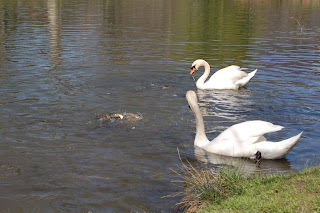 The swans also had some competition for some bread as the fish seemed to be hungry too! except I left off the pink/purple and added another green. 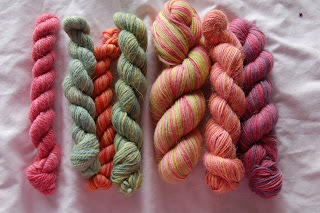 They are all small skeins of sock yarn from the Natural Dye Studio in various yarns including the silk/alpaca which is yummy. It reminds me of Fruit Salad sweets and is fun to wear, though I am not usually a green person at all. Photos soon when I can find a photographer who is better than the two that are here right now. 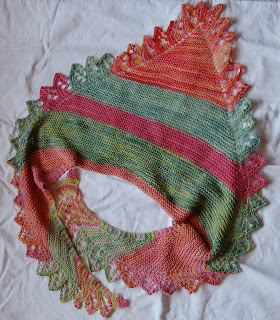 I like that shawl – not fussy, but the edging gives it a little bit of fizz. Lovely shawl. The colors are very “fun” looking and it looks enjoyable to wear. Lovely shawl, and such summery colours – is it your own pattern? it looks to be a shoulder shawl, but it is hard to judge. I would love to knit one of these. Beautiful springtime, beautiful castle and garden and beautiful shawl!! 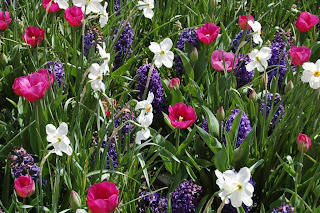 Here in Wisconsin we had 12″ of snow today–a late, wet snow–that buried my daffodils and tulips. I am hoping that spring will come sometime soon here also.